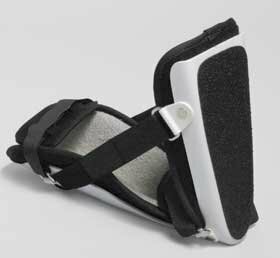 Alimed Pediatric Classic Night Splint helps prevent heel cord and Achilles tendon shortening while sleeping. Hook and loop straps adjust ankle/foot position from 5¼ plantarflexion to -10¼ dorsi-flexion helping to maintain or increase ROM. Indicated for idiopathic toe gait and Post-Achilles Tendon lengthening. Breathable, padded liner. Not for ambulation. Fits left or right. Large fits child shoe size 10 to 12-1/2.